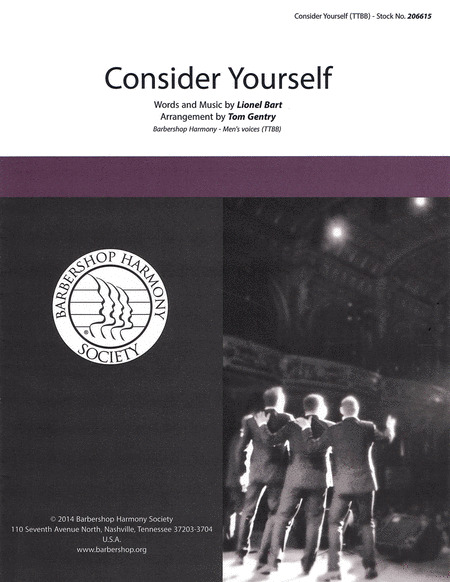 Tom Gentry, one of the foremost barbershop arrangers, has given us this playful, welcoming creation. It captures the spirit and character of the song. Note that the downbeat of measures 48 has a short note to emphasize "Don't Grouse". 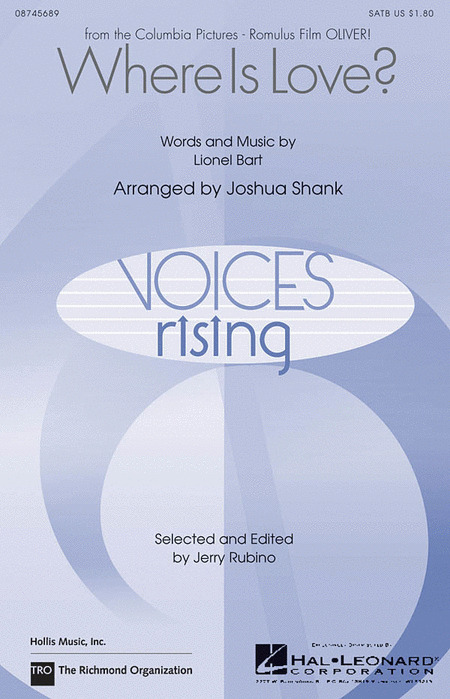 The soaring harmonies and special treatments for individual parts are a delight to the ear. Sing it with joyous mirth! 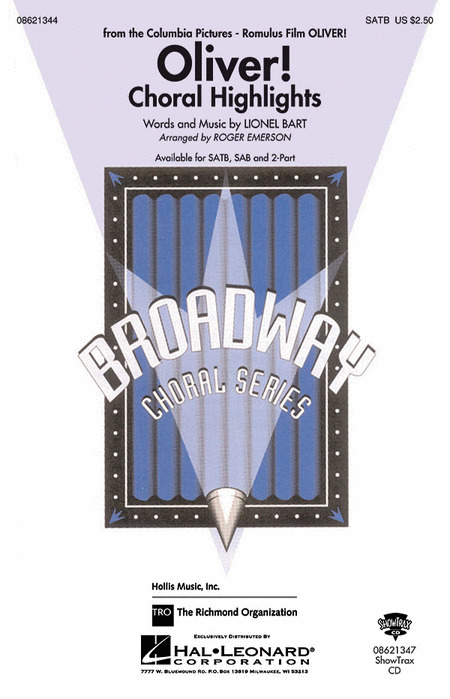 The vocal score to all 32 pieces in the beloved musical, featuring: As Long As He Needs Me - Consider Yourself - Food, Glorious Food - Oliver - Where Is Love? - and more. Arranger: Norman Leyden | Composer: Lionel Bart | Musical: Oliver! Lionel Bart was a writer of English pop music and musicals and is best known for creating the book, lyrics and music for the 1960 hit musical, and later film, Oliver! Tome Gentry, one of the foremost barbershop arrangers, has given us this playful, welcoming creation which captures the spirit and character of the song. The soaring harmonies and special treatment individual parts are a delight to the ear. Arranger: Tom Gentry | Composer: Lionel Bart | Lyricist: Lionel Bart | Musical: Oliver! Now available with a new ShowTrax CD accompaniment, here is the show-stopping answer to the question, More, sir? 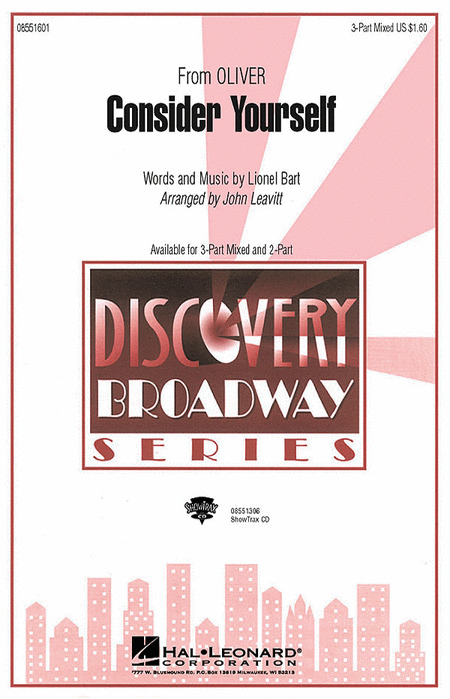 Arranger: Aden G. Lewis | Composer: Lionel Bart | Musical: Oliver! Lionel Bart's wonderful adaptation of the Charles Dickens novel is classic Broadway at its best! This setting in the Discovery series is a natural for young performers.Available separately: 3-Part Mixed, 2-Part and ShowTrax CD. Performance time: Approx. 2:30. Arranger: Mac Huff | Composer: Lionel Bart | Musical: Oliver! Pais Rutherford : Where Is Love? 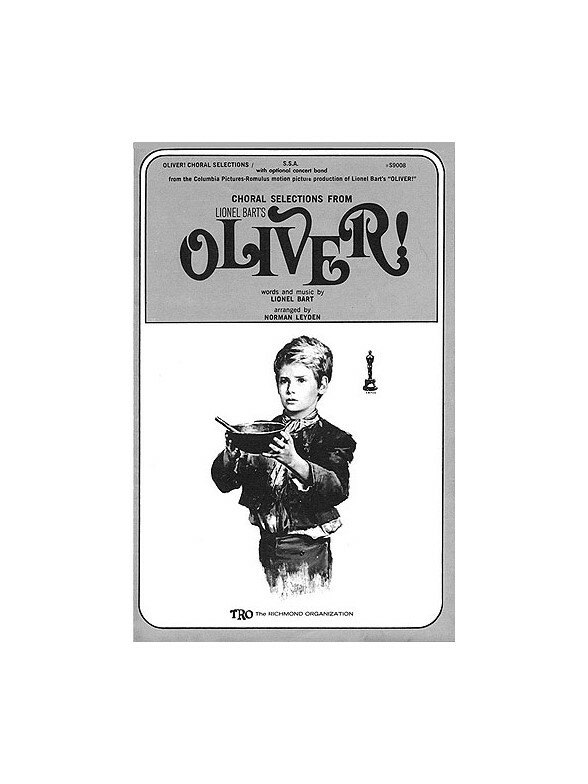 Arranger: Pais Rutherford | Composer: Lionel Bart | Lyricist: Lionel Bart | Musical: Oliver! Norman Leyden : Where Is Love? Mac Huff : Where Is Love? Arranger: Mac Huff | Composer: Lionel Bart | Lyricist: Lionel Bart | Musical: Oliver! Kirby Shaw : Where Is Love? Here is the tender love ballad from Oliver in a shimmering a cappella setting for women's voices. A gem! 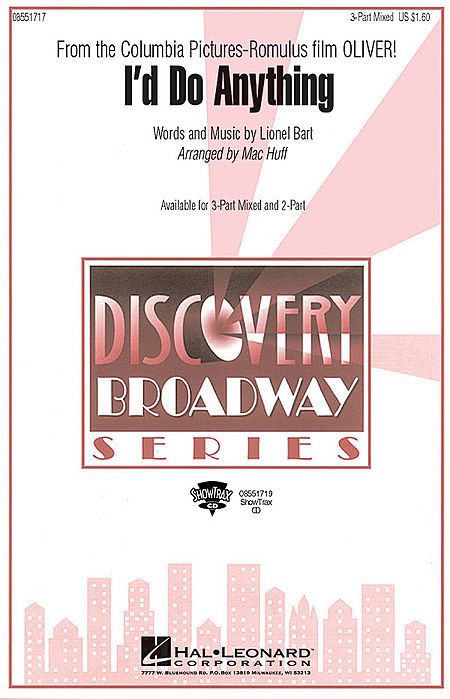 Arranger: Kirby Shaw | Composer: Lionel Bart | Lyricist: Lionel Bart | Musical: Oliver! Joshua Shank : Where Is Love? 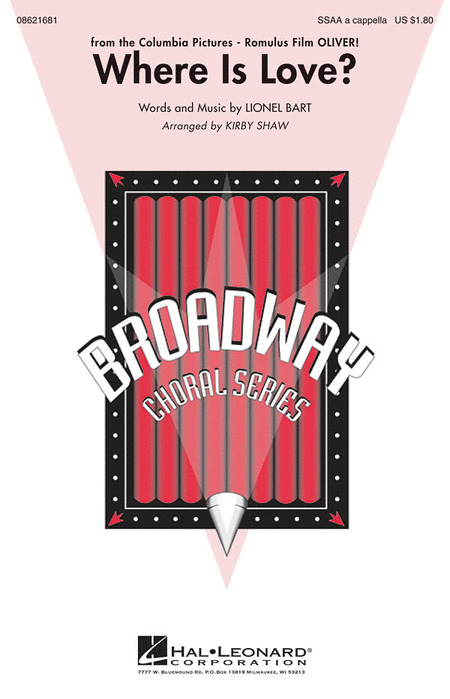 From the Broadway musical Oliver, this contemporary setting offers lush vocal textures over a gentle and flowing piano accompaniment. Duration: Approx. 4:40. Arranger: Joshua Shank | Composer: Lionel Bart | Lyricist: Lionel Bart | Musical: Oliver! Norman Leyden : Who Will Buy?